Dartford Harriers AC are committed to protecting and respecting your privacy. 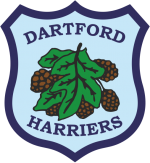 For any personal data you provide for the purposes of your membership, Dartford Harriers AC is the Data Controller and is responsible for storing and otherwise processing that data in a fair, lawful, secure and transparent way. You may give us information about you by filling in forms at an event or online, or by corresponding with us by phone, e-mail or otherwise. This includes information you provide when you register with the Club, subscribe to our newsletter, or participate in discussion boards on our website or social media. The information you give us may include your name, date of birth, address, e-mail address, phone number, name of the EA affiliated Clubs with which you are registered and gender (Athletics Data). We may also ask for relevant personal health information, which is classed as special category personal data, in the interests of personal safety. sending an ad hoc club surveys to improve your experience as a club member. Any special category health data we hold on you is only processed for the purposes of passing health data to coaches and club officers to allow the safe running of training sessions and other events. We process this data on the lawful basis of consent. Therefore, we will also need your explicit consent to process this data, which we will ask for at the point of collecting it. On occasion we may collect personal data from non-members, such as any non-member participant who fills in a health disclaimer or form at a taster event. This information will be stored for no more than 24 months and then destroyed securely. Our lawful basis for processing data is consent. Therefore, we will also need explicit consent from non-members to process this data, which we will ask for at the point of collecting it. The club has the following social media pages: Facebook, WhatsApp, Twitter and Instagram. All members are free to join these pages. If you join one of the Social Media pages, please note that providers of the social media platforms have their own privacy policies and that the club do not accept any responsibility or liability for these policies. Please check these policies before you submit any personal data on the club social media pages. When you become a member of the Club, you will also normally automatically be registered as a member of England Athletics Limited. We will provide England Athletics Limited with your Athletics Data which they will use to enable access to the MyAthletics portal. England Athletics Limited will contact you to invite you to sign into and update your MyAthletics portal. You can set and amend your privacy settings from the MyAthletics portal. If you have any questions about the continuing privacy of your personal data when it is shared with England Athletics Limited, please contact dataprotection@englandathletics.org.